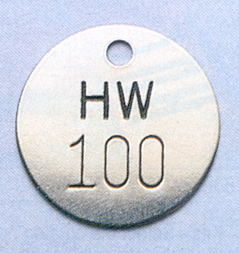 Stainless steel tags are ideal for harsh chemical environments. We do engraved stainless disks, switch plates, legend plates, custom plates for aircraft and much, much more. Whether it's a single plate for your plane or thousands of custom plates to attach to your equipment, American Nameplate can provide on-time and on-budget deliery. In addition to engraving, American Nameplate can also provide PAINT-FILLED engraved plates. We're one of the very few companies that offer this unique service that many companies want for that professional, long-lasting and quickly identifiable look. Let us know what you need. With American Nameplate, there's no setup charge, no minimum and no maximum to the number of tags we can provide. Try us and you'll see that our service is unsurpassed! We'll have some more samples here soon.